Historically, the ceramics trade takes its name from a vast area near Moscow that unites 27 villages and rural communities, collectively referred to as the Gzhel cluster. The village of Gzhel has changed very little over the last hundred years: It remains a small village on the river Gzhelka sealed with a dike. The village is home to little more than seven hundred residents, while over 1,500 are engaged in manufacturing white and blue pottery at small workshops sprinkled throughout the local rural communities. The villages of the area seamlessly merge into an integrated rural area, with its residents traditionally engaged in pottery making. Gzhel State Art and Industry College, founded more than a hundred years ago, stands at the heart of the region. There is also a museum, a row of shopping stalls displaying pottery of blue designs, and several production buildings. The village of Gzhel was first heard of in 1339, as mentioned in a decree by Grand Prince of Moscow Ivan Kalita. The local trade of white clay pottery making goes back all the way to those far-off days. Several grades of raw clay were distinguished, the white one being the best. Thin, pliant and soapy, it was used to produce porcelain and faience. The peasants of Gzhel escaped serfdom – the entire region with its peasants was attached to the Apothecary Prikaz (an administrative body) as intended for earthenware production. About 1,800 pliant white clay deposits were discovered in the village of Volodino. Soon the first porcelain works were founded there. Pavel Kulikov, the founder of the works, had already mastered porcelain production technology at a small factory outside Moscow. By the end of the 1780s, twenty five pottery workshops were producing ware in Gzhel. The clay was harvested in the nearby ravines. When the pottery master was done with his share of production, he called in the apprentices and ware-painters – his sons and daughters. They painted the ware and took it to a large furnace to burn in the design. Apart from the earthenware, many toys were produced in the form of birds and animals, and various figurines featuring scenes from Russian life: glossy white horses, riders, dolls, toy pottery painted purple and yellow and blue and brown after the folk style. Today Gzhel ceramics are produced at several large factories. 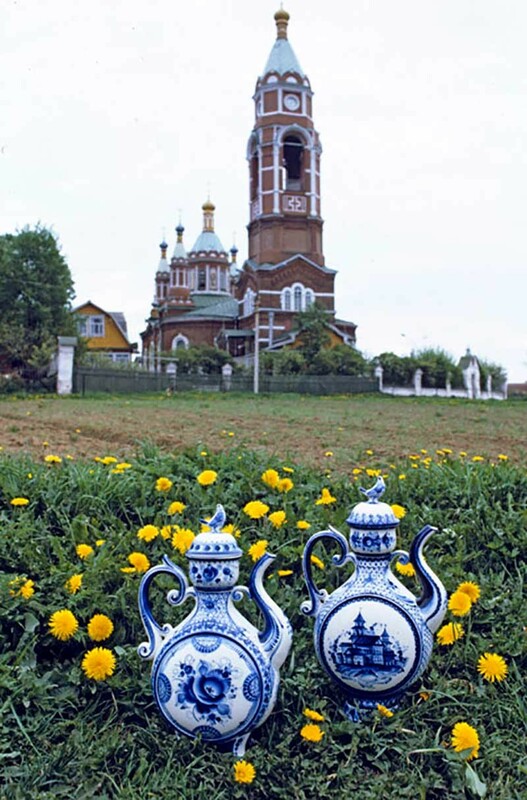 In 2003, the old Gzhel enterprises were replaced by a new porcelain works in the village of Novokharitonovo, while another workshop manufacturing artisanal products is located in Rechitsy village, where the famous Gzhel porcelain has been made since time immemorial. The mold-filling workshops occupy the lower levels, with the upper floors given over to painting workshops. The heavy smell of paints pervades the space. Painters' desks show a display of painting tools: brushes, pallet knives, and jars filled with the “black cobalt” (cobalt oxide). This black mixture turns navy blue when burnt in the furnace. Gzhel Association, another big earthenware enterprise, opened in the 1990s. By now its potters and painters have restored the traditions of the famous bluish-green cobalt design lost well before the October Revolution. This factory houses the Fund of Industrial Prototypes accumulating a vast collection of pieces exposing the history of porcelain production in Russia, including its Gzhel brands. Gzhel experimental ceramics factory, unlike other workshops of the region, sticks to traditional multicoloured ceramics. Cobalt designs are by far not the only ones practiced by the local painters, the term “gzhel” would also include brightly painted pieces made of all colours of clay. The most valuable samples of Gzhel traditional porcelain are displayed in the museum established in the grounds of the Gzhel Association. 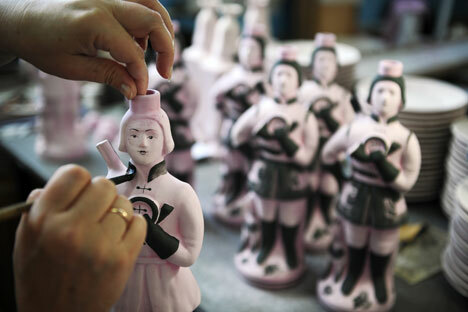 Here visitors are exposed to the process of majolica pottery and porcelain manufacture and can study the technology of earthenware painting, finishing by molding their own handmade pieces of art at the molding workshop. The museum’s collection contains more than 2,000 exhibits, with the earliest dating back to the 15th century.